Oh my God, you guys, Oh my GOD (fun fact: I have no God, that’s just an expression)!! You’ll never guess…I went out to see a PLAY!! TWO plays, even! Is that ginchy or what? Now, sure, I used to do that sort of thing all the damn time…even got to be sort of reputed for it, just ask around (“that’s Kevin, he sees EVERYthing!”…I try, all right, I TRY. ), but it seems like ever since I got back from Clown Camp about 600 years ago I’ve barely made it out to see anything in town. Granted, I’ve been keeping busy with some pretty terrific stuff…making theatre is even more fun than seeing it, who knew? But I love the Theatre scene in my town and was happy to finally get out and take in some shows, now that Fresh Meat 3 was a wrap. And since I’m a little rusty at this ‘writing reviews’ thing by now, I’m making this post a two-fer to really smoosh in the love. And oh yes…there is love. First up was a trip this Tuesday eve to the grand ole NAC for a look at their premiere event of the new English Theatre season, Oscar Wilde’s ultra-mega-classic comedy THE IMPORTANCE OF BEING EARNEST. Directed by Ted Dykstra, and set on a towering collection of pretty awesome backdrops from designer Patrick Clark, who also did the sweet costuming, the tried and true story follows the titular Earnest (or maybe Jack, played by Christopher Morris) as he leads a somewhat unintentional double life in Victorian London wooing the prim Gwendolen (Amy Matysio) in town while being guardian to witty Cecily (Natasha Greenblatt) in the country. His layabout best pal Algernon (Alex McCooeye) takes a rather keen interest in this state of affairs and decides to weasel his way into Jack’s other life. All this is done while doing their collective best to avoid the unforgiving scrutineering of the imperious Lady Bracknell (Karen Robinson, in a goddamn unforgettable turn) and try and sort out the mess they’ve made of things. 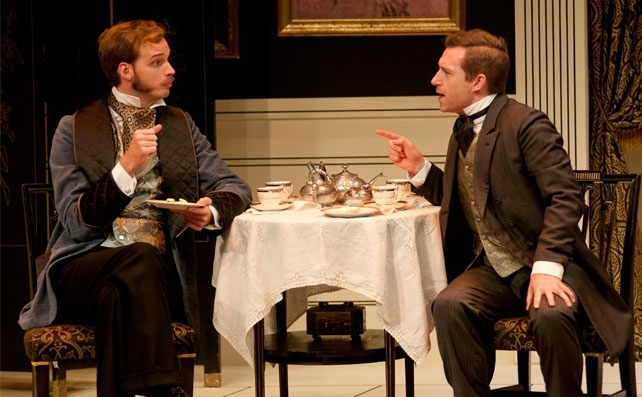 Alex McCooeye and Christopher Morris in THE IMPORTANCE OF BEING EARNEST. 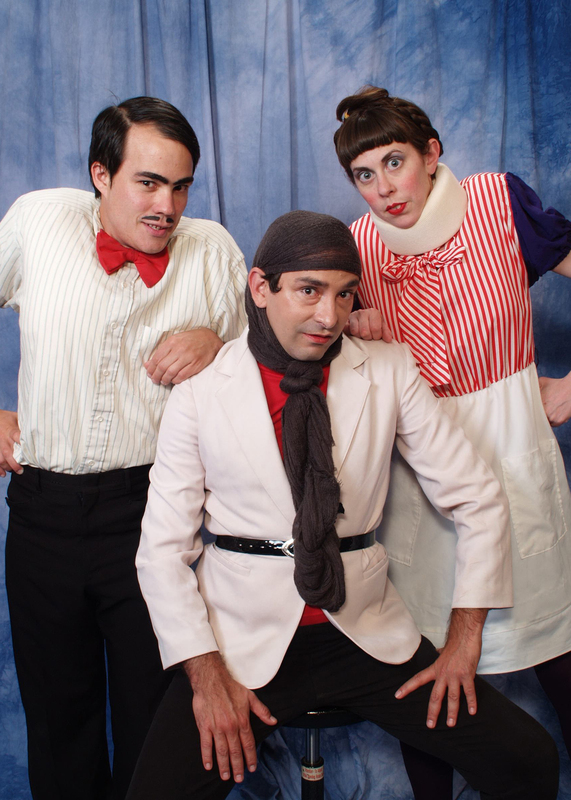 The new NAC acting ensemble gets a terrific showcase in this production, which is tweaked into the over-the-top range just enough to make it irresistibly hilarious. McCooeye and Morris have great fun bantering back and forth as the mismatched Algy and Jack, with some nice physical flourishes added in to keep things jumping. Other ensemblers make memorable appearances as well, with Lois Anderson as the high-strung Miss Prism, Andrew Moodie as ever-proper Reverend Chausable, and Herbie Barnes and David Warburton as Lane and Merriman, the all-seeing servants (God, I love onstage servants, they’re the BEST). But props to Robinson’s Bracknell, who steals a goodly portion of the show…which is, of course, exactly what Lady Bracknell is supposed to do. This a ridiculous and fun time with some classic Wilde, and a great start for the 2014/15 ensemble. But there’s more! 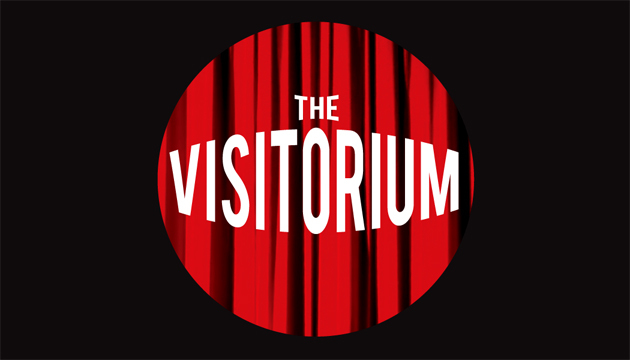 The next night I was stilll achin’ for some more theatrical hijinks, and cruised on over to the Gladstone Theatre to check out their latest, a visiting show from Under the Table and brought to Ottawa by local heroes Black Sheep Theatre. And it was a clown show even!! Right up my own silly alley. So after nabbing me a ticket, I headed in for THE HUNCHBACKS OF NOTRE DAME, a proud production from the Hunchinson Family Players (aka Under the Table Theatre). Before the show got underway, the players were milling in the audience, arming us with props for a big scene near the finale, with brother Johann (Matt Chapman) doing his best to sell some questionable merchandise to the audience, with mixed success (pro tip: don’t take his first offer, he WILL drop the price). Eventually the show gets underway, with big brother Paul (Josh Matthews) leading the way as Writer/Director/Choreographer and actor, in the role of the priest. Johann plays Quasimodo, a role he is determined to transform into the romantic lead if it kills him, and rounding out the family is Hilda (Sarah Petersiel) as Esmerelda, who really, really wants you to know that you can call her ANYtime. Seriously. The Hunchinson Family Players ™, ready to do some Hunching. Your new playwright mission is to craft a show called The Importance of Being Hunchbacked which will be a mash-up of the two. Get Richard on board if you have to. I want it on my desk by Monday. (A Monday, take your pick). “with some nice physical flourishes added in to keep things jumping” is my favorite pun and the first sentence of this article made me laugh. Thanks for the review! Glad to know you’re staying entertained and supporting theater in multiple ways now. Excited for your next foray on stage. Till then, you can continue enjoying your place in my heart. Awwwwww.